There’s nothing more heartbreaking than bringing new tank inhabitants home and watching them stressed and traumatized from improper acclimation. You can reduce shock and stress induced diseases by acclimating all new specimens safely and easily with our professional Patent-Pending drip acclimation method. Providing the smoothest transition for your new tank mates is the single most important decision to safeguard against unwanted distress. Even the slightest differences in temperature, pH, and specific gravity (salinity) are detrimental and prevents a long healthy life. The AccuDrip is the smart investment for relocating new livestock from point A to point B with minimal complications. Its’ Patent-Pending self-priming siphon bulb is the sanitary choice to keep aquarium water off your hands and away from your mouth while displaying a constant visible drip count at eye level. 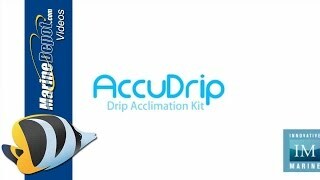 The AccuDrip utilizes a rigid tube that hangs virtually on any aquarium which flows water through a transparent self-priming siphon bulb that doubles as a visual drip counter and is controlled with a precision thumb wheel rolling clamp. Only requires one gentle squeeze to create a siphon guaranteed everytime! Great product very easy to setup , no mess and makes acclimation a breeze. This makes acclimating your fish simple and easy. 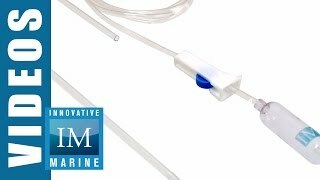 It works very similar to a medical IV drip. You can adjust the rate of flow coming from the acclimator and there is a hook at the top to secure to your tank. Just run some water through it to clean after you're done and store it in the box. Love how easy to use, better then the tie a knot method. Very useful in for auto drip acclimation for , fish , corals and inverts.